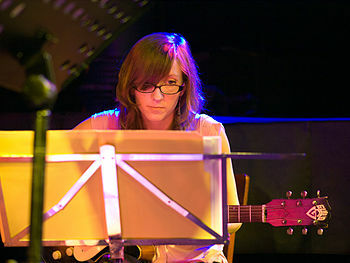 On October 7, 2014, Relative Pitch Records will release Mary Halvorson’s Reverse Blue, the debut of the prolific guitarist/composer’s latest ensemble of the same name, featuring Chris Speed on tenor saxophone and clarinet, Eivind Opsvik on bass, and Tomas Fuijwara on drums. Reverse Blue offers Halvorson a different sonic palette than her critically acclaimed Trio/Quintet/Septet configurations – bringing new musical personalities and timbres to her work, albeit within a classic quartet instrumentation. The exciting and fiery alto saxophonist Jim Hobbs is playing four nights at Douglass Street Music Collective starting Wednesday, August 20. Having developed a take-no-prisoners reputation with his playing and composing among numerous groups in Boston, this groundbreaking artist remains under-appreciated on the New York scene. Having led the Fully Celebrated for a number of years, Hobbs has orchestrated a number of exciting releases with that band and in other contexts. His four nights of performances this week are a great chance for New Yorkers and Brooklynites to get out and hear his latest music. Ars Nova Workshop is thrilled to welcome back Philadelphia legend Albert “Tootie” Heath along with Ethan Iverson and Ben Street in what is sure to be a very memorable evening. Ars Nova Workshop is proud to welcome the Ingrid Laubrock Quintet. An award-winning composer and performer, Laubrock’s style “balances impulsive spontaneity with a structural cohesiveness that occasionally sounds surreal; each of her sophisticated pieces embodies its own distinctive sound world” (Point of Departure). This new group performs Laubrock’s latest compositions, written specifically for this cast of hand-picked musicians, all of whom have established themselves as great improvisers and interpreters of creative new music alike. Featuring saxophonist Tim Berne, trombonist Ben Gerstein, tubist Dan Peck and drummer Tom Rainey, the collective experience of the members includes work with Anthony Braxton, Henry Threadgill, Jason Moran, Carmen McRae, Anita Baker, Bill Frisell, Julius Hemphill, Joe Lovano, John Abercrombie, John Zorn, Dave Liebman, Kronos Quartet, Alarm Will Sound and many others. featuring FRED HERSCH, ANDY BEY, TERRI LYNE CARRINGTON, BILL STEWART, PATRICIA BARBER, A TRIBUTE TO BILLY STRAYHORN, and much more!